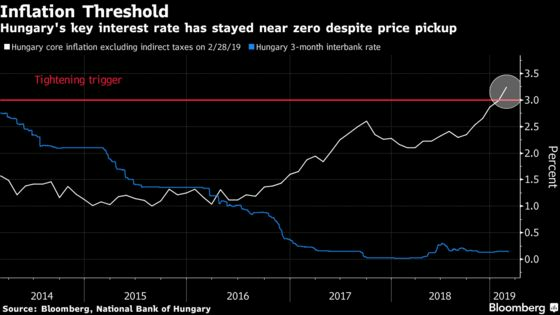 (Bloomberg) -- Hungary’s central bank, one of only a few in Europe pledging to tighten policy this year, defied expectations and triggered a selloff in the forint by announcing a cautious mix of measures and no promise for more. With major global central banks including the U.S. Federal Reserve and the European Central Bank reining in -- or reversing -- plans for stricter policy, the National Bank of Hungary had suggested before Tuesday that it would move against the tide. And while it raised its overnight deposit rate and pledged to reduce the volume of excess cash it pumps into the economy via foreign-currency swaps, Governor Gyorgy Matolcsy said the steps were a one-off and didn’t represent the start of a tightening cycle. In another surprise, policy makers also announced a corporate bond-buying program aimed at stimulating debt markets. “We took a necessary but sufficient decision as a one-off,” Matolcsy told reporters. “This amounts to a change in monetary policy but it doesn’t change its character," he said, adding that it would remain "loose." Matolcsy made a rare appearance to announce the measures after leaving his deputy, Marton Nagy, to explain most monetary policy steps in the past. A long-time advocate of economic stimulus, the governor left little doubt financial conditions would remain accommodative for the foreseeable future. The policy shift comes after months of central bankers pledging to fight surging price pressures that are being fueled by soaring wages and consumption. Core inflation stripped of the impact from indirect taxes, policy makers’ preferred price measure, surpassed a 3 percent target this year and will continue to accelerate into the second half and then slow, the central bank said in a statement. For headline inflation, the monetary authority increased its 2019 forecast to 3.1 percent from 2.9 percent seen in December. It also upped its estimate for this year’s economic growth to 3.8 percent from 3.5 percent. "A dichotomy is observed between the factors determining the developments in inflation," rate setters said in a statement. "Persistently buoyant domestic demand is boosting, and weakening external activity is restraining, the pace of the price increase." The forint weakened 0.8 percent against the euro, on track to close with its biggest drop since 2016 and leading declines among emerging markets after the Argentine peso. Forward-rate agreements, which are used to bet on future borrowing costs, priced out a third of expected tightening and now indicate 30 basis-points worth of increases in the 3-month interbank rate by the year end.